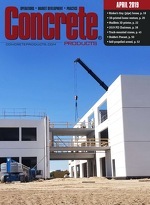 Ernst Enterprises of Georgia Inc. recently upgraded its Lawrenceville headquarters site with a second transit mixed plant, built alongside a smaller model installed in 2002. An overdue pick up in commercial and residential building throughout Atlanta had challenged the producer to keep pace with customers especially fixated on morning deliveries—thanks to peak construction season weather factors and heavy traffic year round. “We have been up 10-20 percent on average the past few years,” says Ernst of Georgia Operations Manager Scott Ovenshire, a 22-year company veteran responsible for five plants on four sites north or northeast of Atlanta. A sister operation, Ernst Cobb County Inc., serves markets north and west of the city, and shares the Lawrenceville headquarters office. After early- to mid-2015 planning and permitting, the new plant took shape on a four-acre site, adjacent to the National Cement Lawrenceville terminal. Opened in mid-2016, the former accounts for about 40 percent of total headquarters output, likely climbing to 50 percent or higher depending on production demands. After a few months of operation and driver orientation, the new equipment attained cycle and loading time as little as 2.43 minutes versus the existing transit mixed plant’s 4.5-minute average. The new Vince Hagan Model LPM14C-220/4-1000/2-1000/2 Stationary Modular Concrete Dry Batch plant is rated at 20 batches per hour, and equipped with 14-yd. aggregate and cement batchers; 36-in. batch belt; four-compartment, 220-ton aggregate bin with four-position turn head; twin, two-compartment 1,000-bbl. cement silos, one overhead, the other an auxiliary with dual 10-in. screw feeders; and, VH245JP silo top, jet-pulse dust collectors plus VH1094JP Jet-Pulse central dust collection system with automatic recycle system and four-sided drive-thru dust shroud. Vince Hagan Co. custom engineered stairways, work platforms and walkways for easy maintenance on all levels. A two-tanker, eight-dump fleet—not hiding an ownership message unique for a multi-plant, Atlanta-area operator—serves two Ernst Georgia divisions. Here, the new Ernst Enterprises of Georgia plant receives a load of fly ash. A tanker with less decorated tractor handles powder transfer to the Lawrenceville silos from the neighboring National Cement terminal. An MPAQ Automation package runs bins feeding the new Lawrenceville plant. In lieu of loader operator monitoring, the PLC-based control system takes bin level indicator signals and automatically keeps overhead aggregate compartments full. The Lawrenceville upgrade saw the addition of an energy-efficient, 10,000-gal. Pearson tank supplying the new and existing batch plants. Ernst staff members find the vessel much more energy efficient than a prior hot water source. Performance insulation sustains target or near-target water temperatures days after a heating cycle.